Enter to win an eBook from Aubrie Dionne! To write a great sci fi romance you need it all, and the blend has to be just right. I’ve come up with a list of what I feel makes a great sci fi romance story. In the comments section, I’d love to hear your own ideas. Must have romance. The romance should drive the plot forward, but also somehow be linked to the science fiction aspect. In Paradise 21, conditions aboard the New Dawn dictate all romantic encounters (The colonists are there to preserve human DNA without genetic mutations or inbreeding), and for this reason Aries escapes. I’ve linked the romance to the science, and made it all drive the plot forward from the very beginning. Must have adventure in cool settings. The best part about science fiction is that you can write it anywhere; aboard a space ship, on an alien planet, or on Earth. Setting is very important, and traveling to different backdrops increases the adventure by tenfold. In Paradise 21, I made sure to have scenes aboard the deep space transport ship, on a desert planet, and even in an alien ship. Must have action. Another awesome part of science fiction romance is all of the various technological weapons you can create: lasers, blasters, subsonic tranquilizer rays. In Paradise 21, I made sure to have at least a couple laser fights, some with people and others with monsters! Must have science. The story must have some basis in reality with fantastical scientific ideas linked to today’s science. In Paradise 21, I posed certain questions: What if people could live their entire lives on a space ship? What would people do when the Earth becomes uninhabitable? Although these ideas seem far-fetched today as you drive to Dunkin’ Doughnuts to order your latte, reality is: the sun will burn out someday, and we may even pollute the Earth before that happens. People will have to find somewhere else to live if humanity is going to carry on. I took a scientific fact and ran with it, creating a fantastical scientific idea. I’d love to hear your own ideas for what makes a great sci fi romance! 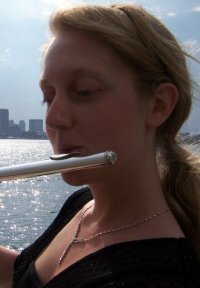 Aubrie is an author and flutist in New England. She's represented by Dawn Dowdle of Blue Ridge Literary Agency. Her short stories have been featured in Mindflights, Niteblade, Silver Blade, Emerald Tales, Aurora Wolf, A Fly in Amer, Moon Drenched Fables and various anthologies. Her books are published by Entangled Publishing, Lyrical Press, Gypsy Shadow Publishing, and Wyvern Publications.